Include a Philips Hue white ambiance bulb in your Philips Hue system and feel better with natural white light that helps you to wake up, energize, concentrate, read and relax. 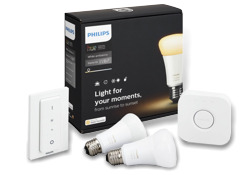 Connect it to the Philips Hue bridge (sold separately) and control it your way. Light influences our mood, behavior, alertness and routines. Through the app, you can set the light that is optimal for your moment. Philips Hue helps you to energize, concentrate, read and relax. Customize your daily routines into moments you can enjoy. Feel different. Feel better.